Quartermaster Sergeant 7463 George Frederick Stevens, 15 Corps, Royal Engineers. she moved the fatherless family to Newbury. 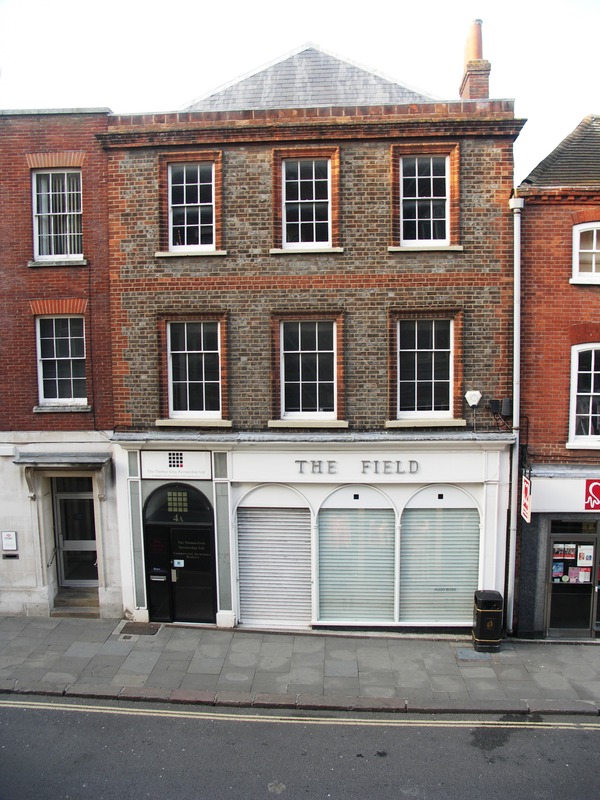 It is now (2017) a ' White Stuff' store. George was born in Gunnersbury, in west London, in 1884 the only son of Frederick George Stevens and his wife Caroline (née Freeman). His birth was registered as Frederick George, but he was known as George and seems to have reversed the order of his forenames (though his marriage was also registered as Frederick). George is used in this story, partly because this is how the Army knew him, but also to avoid confusion with his father. 16 January 1901 George joined the Army enlisting into the Royal Engineers (RE) at Reading. On 5 February he was tested to assess his carpentry skills and was rated as ‘indifferent’ – resulting in a posting as a labourer to 30th Company, RE, at the Sumarine Mining School at Watch House Fort, Plymouth. Until 1904 the RE was responsible for the wnderwater mines protecting the approaches to key British ports – such as Plymouth. Minefields could be laid (the Army had its own ships for this purpose) to either side of the main shipping channel, which could not be protected by the traditional mine anchored to float just below the surface. To protect the main channel mines were laid on the seabed that could be remotely detonated electrically using underwater cables. The RE Company was responsible for all aspects of the mining, preparing, laying, and operation. A special watch tower was constructed below Watch House Fort for their use. At the school George received training in a number of useful skills and, by November 1902 he was rated ‘Superior’, not only as a carpenter, but also in electrical light, fitting and ‘JBB Work’. JBB Work was very specialised, Junction Box Boats were a critical component of the mine system. In addition he was classified as ‘supervisor’ in Test Room work. This was rapid progress – when tested in 1906, he was rated as a ‘very superior’ carpenter after crafting a test piece – in his case a skylight. This rating came with extra pay! In 1903 he was appointed Lance-Corporal and promoted to 2nd Corporal. 2nd Corporal was an unusual rank only used by the Royal Engineers and the Ordnance Corps; it was a single stripe substantive rank, unlike Lance Corporal, which was an appointment. The real difference is that a Lance Corporal had the substantive rank of Private and could revert to this if he changed post whereas a 2nd Corporal would retain his rank on posting to another unit. In 1902 George’s mother, Caroline, remarried to Francis Henry Offer, a boarder at the Guildhall Temperance Hotel she was managing. The birth of George’s half-sister, Frances Mary, followed two years later. The Offers living at 2 Edinburgh Terrace, West Mills. As was typical in an Army career, George moved around; after 3 years in Plymouth he spent 16 months in Jamaica and 3 years at Sheerness. He also elected to sign on for further service, first to spend 8 and then 12 years with the colours. 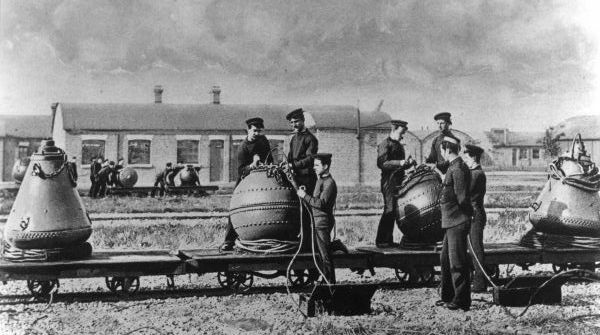 On 14 January 1908 he arrived at Chatham to do a Foreman of Work course at the School of Military Engineering there. He had evidently been earmarked as a man of ability and worth of significant advancement – success on the course would lead to his jumping several ranks to become a Staff Sergeant. After the Foreman of Work course he spent some time at Aldershot then moved on to Pembroke Docks, presumably furthering his training with some work experience. He evidently performed satisfactorily for, on 16 March 1909, he was promoted to Foreman of Works, Staff Sergeant (the modern rank is Clerk of Works). He would be responsible for ensuring that projects were delivered to the specified quality. Often he would be representing the Army on civilian contracts for building installations or facilities from barracks to coastal defences. A year in Sierra Leone followed, during which time he once again opted for more time in uniform, this time for the full 21 years necessary to earn a pension (interestingly his service in Sierra Leone counted double for pension). On 15 August 1908 George married Emily Cooke; like his father he married a Newbury girl; their first child, George Graham was born on 8 March 1909 followed by Douglas William on 19 June 1910. George was born in Kent while George was serving at Chatham, but Douglas arrived into the world in Newbury while George was in Sierra Leone – a posting in West Africa was no place to take a young family. 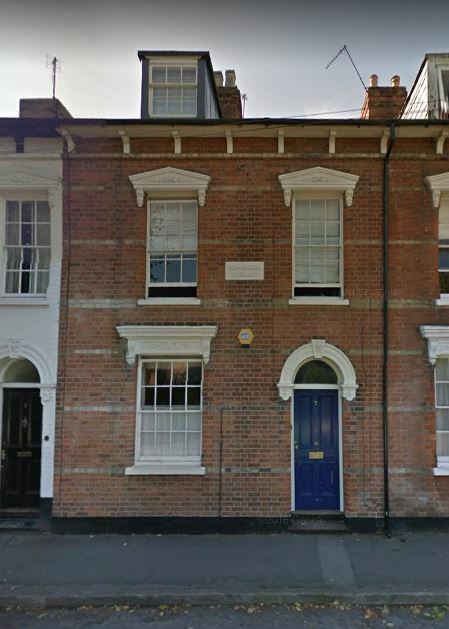 In 1911 he was posted to Newcastle and Richmond B.A.E., but he and his family were in Newbury on census night that year, staying with his mother, step-father and half sister in West Mills. 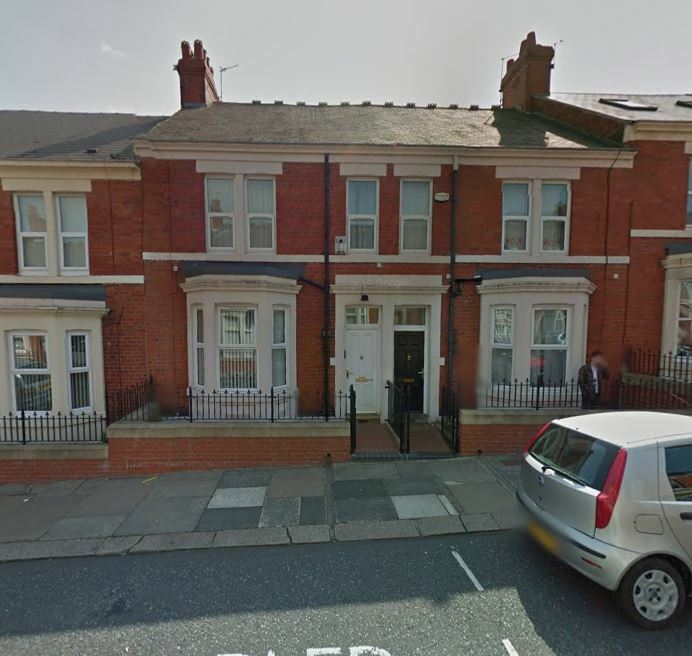 The family moved to Newcastle, living at 99 Wingrove Avenue, and two more sons were born there: Raymond Godfrey on 21 July 1914 and John Howard on 15 June 1917. The eldest children went to boarding schools, George to the Mason’s School. Co Dublin, and Douglas to Christ’s Hospital School at Horsham, Sussex. The latter has special links with Newbury through the ‘Wests Gift’; poor children of Newbury could (and still can) sit an entrance examination (special consideration being given to ‘kin’, usually descendents of the Cox family with who John West, the benefactor, was closely related). If successful the applicant received an education that was beyond the dreams of the average family. When war broke out in August 1914 it is certain that George’s life became a busier one, but there was no major change until, on 16 October 1916 he left for France. In France he served as Master of Works within the Chief Engineer’s department for V Corps. The work was not necessarily much more dangerous that when he was in England, though he would, presumably, need to visit and inspect sites within range of enemy artillery and would also be within range of enemy aircraft and their occasional bombing raids. STEVENS – July 11, in France, Quartermaster-Sergt George F Stevens, Royal Engineers, husband of Mrs E Stevens and only son of Mrs Offer of Edinburgh-terrace, West Mills, Newbury. Another sad war casualty has to be recorded, which not only bereaves a wife and family of three young children, but many Newburians have lost a friend whose death they deeply deplore. Quartermaster-Sergeant George F Stevens, Royal Engineers, was the only son of Mrs Offer, of Edinburgh-terrace, West Mills, and his wife is sister of Mr Henry Cook, of Northbrook-street. He was serving in the Royal Engineers at the outbreak of war, and since then had been stationed at Newcastle-on-Tyne, his wife and family being in residence there. In November last he was sent to the Front, and was home for a few days on leave at Easter-time, owing to the sudden death of his little son, Raymond. QM Sergt Stevens was a fine young fellow, 33 years of age. Official notice of his death was received on Tuesday evening, and the customary royal letter expressing the sympathy of the King and Queen. Sincere sympathy will go out to the wife and family and mother in their irreparable loss. Mrs Stevens left Newcastle on the 11th, the day of her husband’s death, and is now staying with her mother-in-law in West Mills. 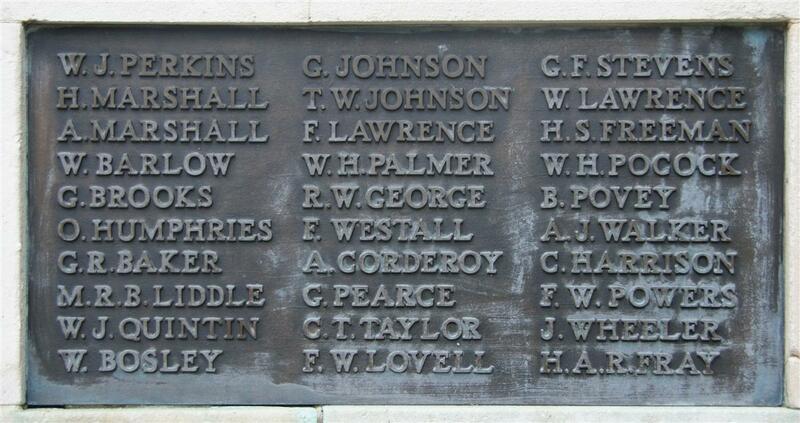 George's name on Newbury War Memorial. The newspaper gives no real detail of George’s death (almost all deaths were instantaneous and pain-free in letters from the front to bereaved relatives). It is most likely that he was inspecting ongoing work near the front (where work had to be done at night to reduce the threat of enemy artillery) when the enemy spotted the activity and shelled the area. Ironically he was 33 years old, the same age as his father was when he too died too young. George was buried in grave I.E.20 at Coxyde Military Cemetery in France. Locally he is remembered on Tablet 5 of the Newbury Town War Memorial and also on the parish memorial board and roll of honour in St Nicolas’ Church.